Hollywood plots consist of clear chains of causes and effects, and most of these involve character psychology (as opposed to social or natural forces). Each major character is given a set of comprehensible, consistent traits. The Hollywood protagonist is typically goal-oriented, trying to achieve success in work, sports, or some other activity. The hero’s goal conflicts with the desires of other characters, creating a struggle that is resolved only at the end – which is typically a happy one. Hollywood films usually intensify interest by presenting not one but two interdependent plot lines. Almost inevitably one of these involves romance, which gets woven in with the protagonist’s quest to achieve a goal. The plot will also arouse suspense through deadlines, escalating conflicts, and last-minute rescues. Chungking Express isn’t your typical Hollywood film. Wong Kar-wai’s Chungking Express is a unique film that eschews the formula of most Hollywood movies. The dichotomous nature of the film is one of biggest pieces of evidence that this movie does not entirely adhere to the constraints of classical Hollywood cinema. Instead of one, overarching narrative, it focuses on two unique, loosely interconnected vignettes which allow the movie to avoid the standard three-act story structure altogether. The two stories do echo one another thematically and tonally, but they ultimately feel like two very disparate halves that do not complete one long, consistent story arc. According to film scholar David Bordwell, the classical Hollywood film structure involves a protagonist whose psychological motivations remain consistent and predictable throughout the film, and whose primary conflict usually involves some sort of end goal which is achieved at the film’s conclusion. In many ways, both the story of He Qiwu (Takeshi Kaneshiro) and Officer 663 (Tony Leung) fulfill this parameter; both feature compelling, clearly defined protagonists who makes logical decisions in an effort to accomplish some sort of goal. However, neither narrative has the opportunity to play out fully; in this way, the two stories more closely resemble short films that lack a full-length, Hollywood arc. The biggest difference the stories of Chungking Express and typical Hollywood films is that Wong Kar-wai does not give them enough time to resolve their primary conflicts. For example, in the first half of the film, Qiwu is struggling to get over his ex-girlfriend May. He is holding on to the hope that because she decided to stop seeing him on April 1st, April Fool’s Day, her purported desire to end the relationship was really an elaborate joke. When he finally accepts the reality that May is not coming back to him, Qiwu decides to distract himself by speaking to a young woman (Brigitte Lin) at a bar with whom he instantly finds a connection. At this point in a typical Hollywood film, a relationship might be given time to form between Qiwu and his new partner. In Chungking Express, however, the success of his interaction with this mysterious blond character is reduced to a simple voice message left on his phone after spending a quiet night together. Though charmingly off-beat, this “relationship” between Qiwu and the blond woman never really comes to fruition. Bordwell continues to define the classical structure of Hollywood films by stating that they involve “deadlines, escalating conflicts, and last-minute rescues,” which are “resolved only at the end.” He goes on to state that this ending is “typically a happy one.” In neither of the two stories in Chungking Express do we find any significant rising tension, conflict resolution, or happy endings. Qiwu and Officer 663 both struggle with their respective prior relationships before meeting someone brand new, but there is no true conclusion to these conflicts in either case. And certainly, neither protagonist has the happy ending we expect from Hollywood films; in both cases, though the protagonists meet new potential love interests, their stories are cut off before the audience has a chance to see their romance blossom. In the first half of the film, no tension is built that Qiwu has to deal with as the protagonist. In an almost deceptively Hollywood-like manner, we are given a deadline of May 1st by which we expect to see Wong Kar-wai reveal an uplifting conclusion to Qiwu’s tumultuous relationship with May. Instead, we find that come May 1st, he has received no messages from his girlfriend and is forced to move on. His final scenes with the woman in the blond wig show that he has the potential to achieve that happy ending, but this reality is left to the imagination of the audience. As aforementioned, Qiwu’s newfound relationship with the woman with the blond wig culminates in a simple happy birthday wish. While Qiwu takes this to mean the start of something new and wonderful, the audience can see that this is not equivalent to what he had had with May. In the second story, when Officer 663 finally begins to look at Faye (Faye Wong) as a potential love interest, she leaves him to go to America. And while she does eventually return to Hong Kong where they meet once more, her new status as a flight attendant making her a better fit to replace his previous relationship, their relationship is still stilted and unformed. Their fate is once again left to the interpretation of the audience. In the Bordwell definition of Hollywood structure, the protagonist must also follow “two interdependent plot lines,” one of which is a heterosexual romance “which gets woven in with the protagonist’s quest to achieve a goal.” In both of the stories in Chungking Express, it can be argued that the only goal is heterosexual romance; Qiwu is trying to get over May, and Officer 663 is trying to get over his relationship with the flight attendant. Beyond that, both characters have steady jobs, a reasonable income, and generally seem to be enjoying their lives. The typically secondary romantic arcs take center stage, while no other plot lines appear to complement them outside of the mysterious drug-smuggling operation involving the blond woman. Officer 663 and Faye seem to have a real shot at completing their story arc. Chungking Express is rife with hints of classical Hollywood structure, but Wong Kar-wai does not restrict himself to this rigid framework. In a similar vein to Woody Allen’s Annie Hall and Marc Webb’s (500) Days of Summer, he takes many of these conventions and twists them around on the audience. 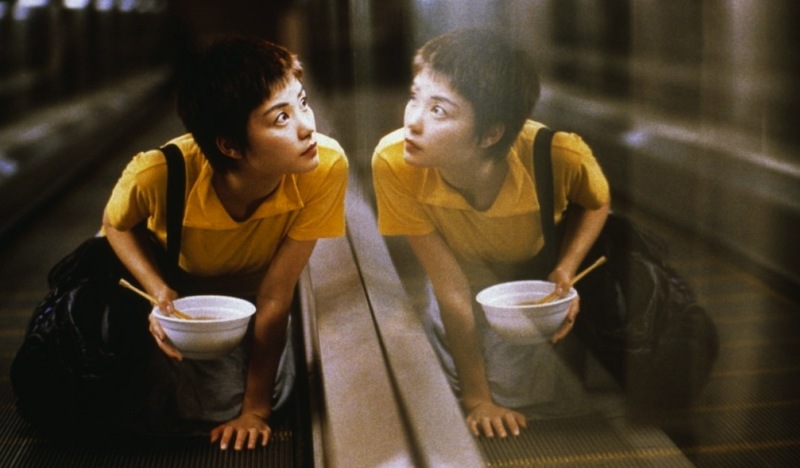 Kar-wai has made a statement about what we should expect from romantic films with Chungking Express; he puts a great emphasis on bittersweet happiness, suggesting that while we can hope to rekindle what was lost, we should look more to the future for what might be as good if not better. To do this, he avoids giving his stories the neat conclusion typical of Hollywood narratives, and instead trusts the audience to extrapolate their own answers based on the story they’ve been shown.